Win a $4,000 Bassett Home Furnishings gift card and a design consultation (9 winners)! ENTRY LIMIT – There is a limit of one (1) entry per person/ e-mail address per day. Home Furnishings store location throughout the Sweepstakes Period and awarding of the prize. 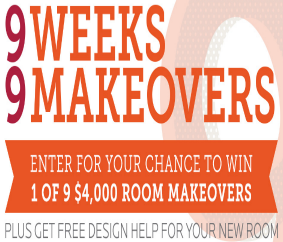 SWEEPSTAKES ENTRY PERIOD – The Bassett “9 Weeks, 9 Makeovers” Sweepstakes begins at 12:00 am Eastern Time (“ET”) on August 24, 2015 and ends at 11:59 pm ET on October 25, 2015. $4,000 Bassett Home Furnishings gift card and design consultation.